So I found myself in San Diego on a business trip and I decided to go site seeing. 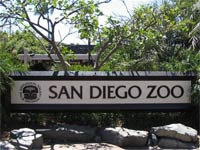 Something I am always hearing about when people start mention San Diego is the zoo, so I figured I would go check it out. My company didn’t offer me a means of transportation when I arrived, but I didn’t want to get stuck in the hotel all week. So I went on my favorite website Rental Car Momma and found a great deal from Dollar Rental Car and got myself a Dodge Caravan for the week, so I could do whatever I wanted. So back to the story at hand, the San Diego Zoo was incredible. When I was thinking zoo I imagined a bunch of animals in cages, but the San Diego Zoo mine as well be its own theme park. First off I want to say that the zoo here isn’t like those dinky old $5 a person zoo you find in your local neighborhood. No, the Sand Diego Zoo was separated different sections with different themes, rides, attractions and shows that showcased the different animals and their unique traits and abilities. My favorite was the Urban Jungle section of the park. You could take a tour that got you right in the midst of all the animals. The most interesting part of that area specifically was the bears. They had a trainer show you how the animals had adapted to their lives in habitats rather than in the wild, and some of the reasons these specific animals weren’t going to be released back into their forests. The San Diego Zoo is great; I guess it would be kind of hard to explain it all without you being able to visit. But if you are in the San Diego area I would definitely suggest you visit, its worth the time and money.